What do you think of when you hear the word gene? Do you associate it with bad things like the risk of heart disease or cancer? 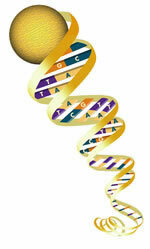 or do you think about personalized medicine and the improvement of human health? or simply part of our nature and a determinant of heredity? About a decade ago German historian Barbara Duden and geneticist and sociologist Silja Samerski collaborated on a project to try to understand what people mean when they use the term gene in everyday conversations. They found that people use the term frequently, even when they didn't have a good understanding or clear definition of what the term meant. Duden and Samerski were interviewed on CBC's "How to Think About Science" radio show to talk about their work. So what does the term gene signify in everyday speech? It turns out it means different things to different people. And even individuals may have contradictory feelings, associating the term not only with impersonal scientific experts and health risks, but also the potential for a utopian future where the failings the human body have been cured. Understanding the term gene as a scientific construct requires a fair amount of background knowledge and education in genetics. Duden argues that for those without a scientific background, the term can be "mystifying and disorienting" when used in everyday speech, and that it has no place there. Her colleague Samerski draws on her on experience as a geneticist to suggest that confusion in terminology can add to the stress and confusion pregnant women experience in genetic counseling sessions. Genetic counselors provide an analysis of the probability a developing fetus will have a genetic disorder such as Down Syndrome or cystic fibrosis. But they can only talk about what may happen, since they cannot know what will happen. That puts women in a difficult position of having to make decisions about their pregnancy based on a statistical risk analysis that can be difficult to understand. Samerski argues that the "quasi mythic power" of genes in popular culture may make the statistical probabilities relating to genetic risk profiles more difficult for pregnant women to grasp. So how can this situation be improved? If people are getting conflicting messages through popular culture regarding what genes represent, then perhaps popular culture is also the best way to generate better understanding of genetics. "Genes" (along with "mutants" and "genetic engineering") are often used as a simplistic plot device in movies and TV shows to explain changes in human health and behavior and abilities ranging from childhood diseases to the sudden onset of super powers. But entertainment necessarily uses shorthand when it comes to science, and I think there is an assumption that viewers are at least passingly familiar with the scientific terminology they use. Certainly a genetics lecture would seem out of place in the middle of an X-Men movie. I would argue that a better place to start would be the news media, which often seems to simply regurgitate exaggerated press releases when reporting new scientific developments. Breathless headlines and poor explanations of the latest genetic findings do make "genes" seem almost magical. It's not at all surprising that many people are confused. And I'd like to think that better public understanding of genetics would lead to more realistic depictions of genes and mutations in popular culture as well. Imagine that! Listen to "How to Think About Science" Episode 15 with Barbara Duden and Silja Samerski. Read the interviews with Duden and Samerski and other guests on "How to Think About Science" in the book Ideas on the Nature of Science . Top image: "DNA Strands" from the Office of Biological and Environmental Research of the U.S. Department of Energy Office of Science (science.energy.gov/ber/), with credit to the U.S. Department of Energy Genomic Science program (http://genomicscience.energy.gov).Available through the Department of Energy's Office of Biological and Environmental Research Image Gallery Gateway.